TORRANCE, Calif., June 12, 2006 -- LEDtronics announces the availability of its TBL3xxF series sealed tube LED light strips that offer great illumination in many versatile applications. The TBL3xxF series comes with a milky frosted lens that provides diffused illumination in applications such as RVs, buses, trains, task lighting, under cabinets, concealed lighting, edge lighting, cubicles, marine recreation applications and retail store displays. 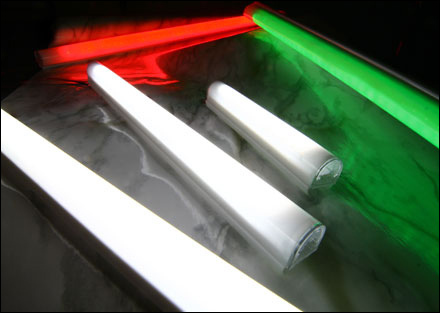 The construction of a sturdy UV-resistant polycarbonate housing over the LED tube provides increased protection and shielding against many environmental effects, allowing the placement of these light tubes in locations where typical lights would be more vulnerable to the elements, according to the company. The TBL3xxF series tubes come in a variety (6, 12, 24 and 48 inches) of lengths to fit in many different locations, tight enclosures and spaces. The lights are available in 6000K Pure White and 3000K Warm White colors, all operating at 12V. Both whites use .96 W for the 6-in. model, 2.16 W for 12 in., 3.84 W for 24 in. and 7.68 W for 48-in. lengths. Pure white 6000K LEDs give off 52 lm at 6-in. lengths, 116 lm at 12 in., 206 lm at 24 in. and 413 lm at 48-in. sizes. Warm white 3000K LEDs radiate 40 lm for 6 in., 89 lm at 12 in., 158 lm at 24 in., and 317 lm at 48-in. length sizes. Other LED colors are available for OEM customers.